The two anthropomorphs on the right side of the Perfect Panel with a two-toned snake to the right of them. These pictographs are in amazing condition and contain a lot of fine detail. This is certainly one of my favorite sites that I have had the pleasure of visiting. 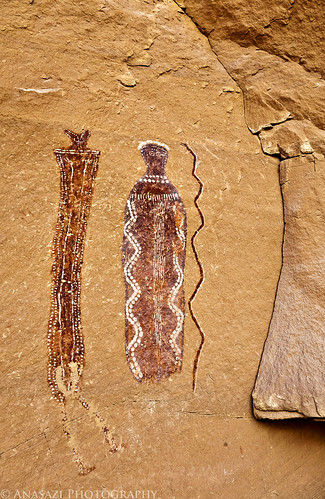 The figure on the left is a bit odd as it has two long but thin legs with feet, which are very uncommon in the Barrier Canyon Style. It also appears that those legs may have been partially pecked out at some point, too. Click on the photo to view a larger size over on Flickr if you want to examine the details.